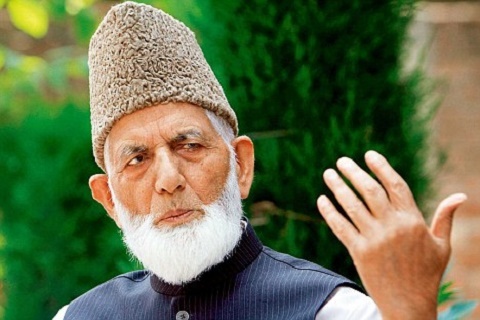 In occupied Kashmir, the Chairman of All Parties Hurriyat Conference, Syed Ali Gilani, has expressed serious concern over the increasing tension between Pakistan and India on the Line of Control and Working Boundary. The APHC Chairman deplored that the Indian forces’ personnel had created mayhem in occupied Kashmir and turned it into a slaughter house. He hailed the people of the territory for their commitment and determination. “Despite atrocities perpetrated by the Indian forces, people are braving bullets and pellets and this serves a message for the oppressors that they can never suppress our aspirations or force us to submission,” he added. Syed Ali Gilani said, the valiant people of Kashmir have proved, time and again, that no amount of Indian state terrorism could dissuade them from pursuing their inalienable right to self-determination. Despite India using all its resources and military might during the last over 70 years, the issue is there and not an iota of change seems to have happened on the ground, he said. Meanwhile, an APHC spokesman in a statement strongly condemned the continued house arrest of Syed Ali Gilani. He said that the octogenarian leader was again disallowed by the puppet authorities to offer Friday prayers even in the month of Ramadan. He termed the puppet authorities’ action as a brazen interference in religious affairs.